I remember buying my copy of The Ruby in the Smoke at a B. Dalton bookstore in San Antonio, Texas. 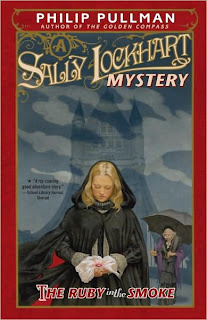 I liked the cover with the young girl in the cape holding something mysterious in a white handkerchief for a slightly creepy old woman to inspect. But, in the end, this was yet another example of a book I bought for the opening lines alone. On a cold, fretful afternoon in early October, 1872, a hansom cab drew up outside the offices of Lockhart and Selby, Shipping Agents, in the financial heart of London, and a young girl got out and paid the driver. She was a person of sixteen or so--alone, and uncommonly pretty. She was slender and pale, and dressed in mourning, with a black bonnet under which she tucked back a straying twist of blond hair that the wind had teased loose. She had unusually dark brown eyes for one so fair. Her name was Sally Lockhart; and within fifteen minutes, she was going to kill a man. Yeah, there was sort of no way my 12-year-old self wasn't going to make a beeline to the cash register with that one. All I knew was that it was set in Victorian London, it was a mystery, and it clearly featured a girl I wanted to get to know better. I had no idea it was the first in a trilogy, or how involved I would become in the incredibly intricate plot that stretches out over all three books. 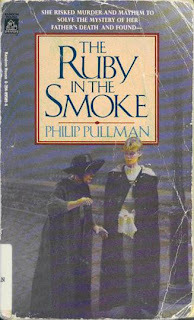 It should be noted that Pullman published a fourth volume almost ten years after The Ruby in the Smoke, but it is less of a direct sequel and more a companion novel to the original trilogy. Sally Lockhart is so very far from your average 16-year-old. Even your average 16-year-old in 19th century London. Her father has recently been murdered and she is intent on uncovering the identity of his killer and bringing the villain to justice. As such, she comes to his offices in London to meet with his partner and find out if he knows anything about Mr. Lockhart's demise or the phrase, "Beware the seven blessings," which she came across in a fragment of a letter sent to her from Singapore. Shortly after her arrival she becomes embroiled in another murder, the vagaries of the opium trade, and the mystery of the disappearance of the fabled Ruby of Agrapur. Along the way she encounters a few associates who become true friends, including a young scarecrow of an errand boy named Jim Taylor and an amiable photographer by the name of Frederick Garland. She will have need of her friends before the game is played out and she races against the clock to make sense of her convoluted past and discover just who is behind the strange web of betrayal and deceit that has taken over her life. Everyone is familiar with Philip Pullman's much more famous His Dark Materials trilogy. I snatched up the first book when it came out because I was already a huge Pullman fan because of the Sally Lockhart books. And I enjoyed The Golden Compass just fine. But I got halfway through The Subtle Knife and the whole thing just...petered out for me. I'm still not exactly sure what happened except that I kept wishing the entire time I was reading about Sally instead. But in my experience few people have read this set of excellent mysteries. They are dark, dire, and grim, to be sure. But they are also absolutely delightful. And bite-your-nails-to-the-quick intense. Sally herself is such a strong character--a perfect blend of independence, diffidence, integrity, and intelligence. Following her growth and development over the course of the trilogy is an absolutely moving experience. Each book matures in both subject matter and length. 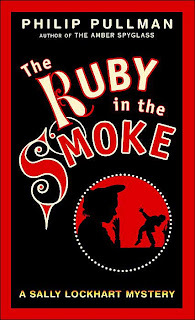 The Ruby in the Smoke reads like Dickens meets Arthur Conan Doyle meets Lloyd Alexander and that combination proved too charming for me to resist. I could not put it down until I finished it and I immediately went out and bought the next two books. They did not disappoint, but rather ratcheted up the stakes with each passing page. Pullman somehow manages to create the atmosphere of a vintage penny dreadful, while peopling it with fully fleshed out characters who work their way seamlessly into the reader's heart and affections. In fact, I vividly remember breaking down sobbing while reading a certain scene in the second book--Shadow in the North. It is one of my very first memories of connecting with a set of characters so much it was physically painful to me to watch them suffer. An engrossing series highly recommended, particularly for fans of Libba Bray's Gemma Doyle trilogy and Laurie R. King's Mary Russell series. Reading order: The Ruby in the Smoke, The Shadow in the North, and The Tiger in the Well. Companion novel: The Tin Princess. This is one of my favorite series! I remember picking the Tin Princess up as a little girl in the 5th grade, but I wasn't able to really get into it. Also, it's part of this series, like a side story. I picked up The Ruby in the Smoke when I was in high school, like I think my sophomore or junior year, and I gobbled up the whole trilogy. I'm a huge mystery lover and proponent of strong female characters. Pullman really creates the perfect blend of mystery and romance and adventure, all set in the Victorian period. I know the scene you're talking about Shadow in the North; it broke my heart too. I've been meaning to pick these ones up forever! I felt the same way about His Dark Materials, never having finished the series. But, I think Ruby in the Smoke has been on my TBR for a long time now. Time to move it up. I had the same issue with His Dark Materials. I managed to get through The Subtle Knife, but I didn't get past the first few pages of the third book. On the other hand, I read all four of the Sally Lockhart books (even The Tin Princess, which isn't really a Sally book, even though she's in it). And I think I know exactly what scene you're talking about in The Shadow in the North. When I read that, I was flabbergasted. I don't think I'd read a book up to that point where the author had done something that... well, shocking. My reaction was, "What? WHAT?!" This was followed by a lot of flipping pages back and forth, making sure I'd read correctly. And then I felt like crying for the rest of the book. But I finished the series and enjoyed it. I think that says something about the author and the quality of his storytelling. Crazy, I just checked this out from the library last week! Good review, I'm excited to read it! Britt, yep, very few HDM readers know he wrote this Victorian mystery series first. And that they're so good. Melissa, that's interesting to hear as I usually get the Alien-with-two-heads look when I say I didn't love the HDM books. Hope you get to this series soon and enjoy it! La Coccinelle, that makes me feel like less of a freak that you reacted the same way. *sigh* I wish I'd liked them. I just...didn't. And that scene? I felt the same way as you. I was completely unprepared for it because I had never read something like that before. And as you said, I still loved the book. Felt, in fact, pretty attached to it. But it demolished me in the reading of it. Kath, how weird is that?! Hope you enjoy it. The 2nd and 3rd are even better! I've heard about this series but haven't had a chance to pick them up. Thanks for reminding me how much I enjoy Phillip Pullman. This Retro Friday feature adds to my TBR Every. Time. In fact, your blog adds to my TBR every time! Sorry Angie but you're getting the Alien with two heads look from me. The Subtle Knife was my favourite and I LOVE the whole series, in fact I think I'm due for a re-read. I haven't read the Sally Lockhart books but I did enjoy the BBC adaptation of it. Have you seen it? My YA teacher was singing the praises of this book last week! I'll have to read it. I *love* this series, and I think we're on the same page regarding Pullman's other work - I, too, wish he'd give the religious philosphizing a rest and get back to Sally. Michelle, anytime. :) I think you'd be intrigued by them. Alexa, see, you are totally not alone. And I've really been meaning to give the series another go because I thought for sure I was missing something. It's been quite awhile so perhaps it's time. I knew about the BBC tv movie but haven't seen it. I'd definitely like to. It's too bad they didn't do them all. Rhiannon, what nice timing. :) Definitely check it out. Alison, it's just that I could always read more about Sally. I even started THE TIGER IN THE WELL very nervously after the way things went in THE SHADOW IN THE NORTH and then he went and pulled it off beautifully. My budget cries, my heart rejoices, every time I stop here. Angie, I read The Ruby in the Smoke in 8th grade and loved it! But my middle school library didn't have the rest of the series, nor did the high school library, nor the public library, so I finally gave up the search and eventually forgot all about it. But now I know what I'm searching for next time I go to the library here! Allie, no way! That is one sad story, my friend. But now is probably the perfect time to read the next two books. I think you will really enjoy them. Let me know if your library's got 'em! I really need to get around to reading The Shadow in the North since I enjoyed The Ruby in the Smoke so much. Casey, you're welcome! And I think you'd really like THE SHADOW IN THE NORTH. It's one great story.